This comprehensive tutorial guide to silicon nanomaterials spans from fundamental properties, growth mechanisms, and processing of nanosilicon to electronic device, energy conversion and storage, biomedical, and environmental applications. It also presents core knowledge with basic mathematical equations, tables, and graphs in order to provide the reader with the tools necessary to understand the latest technology developments. Covers fundamental concepts, properties, methods, and practical applications. 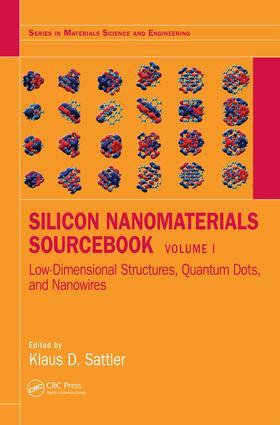 Focuses on one important type of silicon nanomaterial in every chapter. Discusses formation, properties, and applications for each material. Written in a tutorial style with basic equations and fundamentals included in an extended introduction. Highlights materials that show exceptional properties as well as strong prospects for future applications. Klaus D. Sattler is professor physics at the University of Hawaii, Honolulu, having earned his PhD at the Swiss Federal Institute of Technology (ETH) in Zurich. He was honored with the Walter Schottky Prize from the German Physical Society, and is the editor of the sister work also published by Taylor & Francis, Carbon Nanomaterials Sourcebook, as well as the acclaimed multi-volume Handbook of Nanophysics. Klaus D. Sattler pursued his undergraduate and master’s courses at the University of Karlsruhe in Germany. He received his PhD under the guidance of Professors G. Busch and H.C. Siegmann at the Swiss Federal Institute of Technology (ETH) in Zurich, where he was among the first to study spin-polarized photoelectron emission. In 1976, he began a group for atomic cluster research at the University of Konstanz in Germany, where he built the first source for atomic clusters and led his team to pioneering discoveries such as "magic numbers" and "Coulomb explosion." He was at the University of California, Berkeley, for three years as a Heisenberg fellow, where he initiated the first studies of atomic clusters on surfaces with a scanning tunneling microscope. Dr. Sattler accepted a position as professor of physics at the University of Hawaii, Honolulu, in 1988. There, he initiated a research group for nanophysics, which, using scanning probe microscopy, obtained the first atomic-scale images of carbon nanotubes directly confirming the graphene network. In 1994, his group produced the first carbon nanocones. He has also studied the formation of polycyclic aromatic hydrocarbons (PAH) and nanoparticles in hydrocarbon flames in collaboration with ETH Zurich. Other research has involved the nanopatterning of nanoparticle films, charge density waves on rotated graphene sheets, band gap studies of quantum dots, and graphene folds. His current work focuses on novel nanomaterials and solar photocatalysis with nanoparticles for the purification of water. He is the editor of the sister reference, Carbon Nanomaterials Sourcebook (CRC Press, 2016), Fundamentals of Picoscience (CRC Press, 2014), and the seven-volume Handbook of Nanophysics (CRC Press, 2011). Among his many other accomplishments, Dr. Sattler was awarded the prestigious Walter Schottky Prize from the German Physical Society in 1983. At the University of Hawaii, he teaches courses in general physics, solid state physics, and quantum mechanics.